Do you take medication for an existing medical condition? Are you allergic to any particular drug? If you were suddenly taken ill at home, who would have this information? Early treatment can save lives. Simply enter the details on the form provided, pop the form in the bottle then put the bottle in your fridge. Stick the special Green Cross symbol provided on your front door so the emergency services will know! Easy! 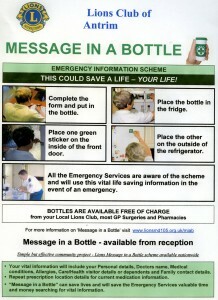 Look in your doctor’s waiting room or your local chemist or Health Centre for your FREE Message in a Bottle. 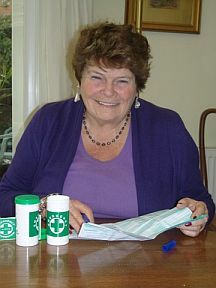 The scheme is sponsored and organised by Lions Clubs in the United Kingdom and is FREE to the user.